Quickly and professionally produce business cards with bleed edge design. Easily converts 8 1/2" x 11" sheets to finished 2" x 3 1/2" business cards with a simple two pass operation. Cuts up to 360 cards per minute. This is MyBinding video. 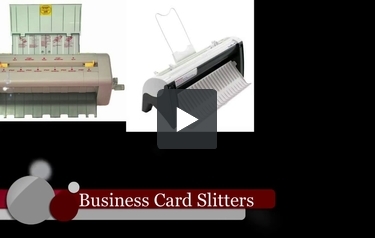 Using a business card slitter, you can quickly and easily produce business cards on demand. Here at MyBinding.com, we have quite the selection of business card slitters, ideal for small print shops, copy shops and for corporate environments as well as the home office for small, small business. Using the high quality business card slitter, printers can increase their profitability by allowing them to produce short runs of business cards using their digital printing equipment. With such brands as Akiles, DFG, JPL and Tamerica, we have what you need. And our customer service loves to answer the phone to help you find exactly what your business requires and the machine that’s perfect for it. You can choose from 12 up, 10 up, 8 up and gutter cut business card slitters. When image matters, MyBinding.